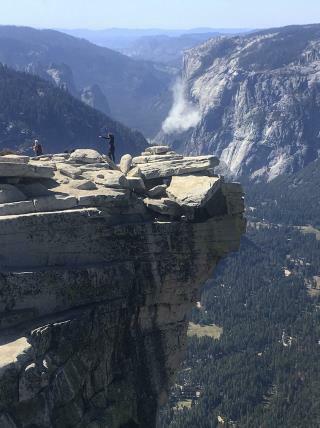 (Newser) – A massive new rockfall hit Yosemite National Park on Thursday, cracking with a thundering roar off the El Capitan rock formation, injuring one person and sending huge plumes of white dust surging through the valley floor below. The slide came a day after a giant slab of granite plunged from the same formation, killing a British man on a hiking and climbing visit and injuring his wife, the AP reports. Climber Ryan Sheridan, who saw Thursday's rock fall from the top of El Capitan, says the new slide occurred in the same location as Wednesday's but was at least three times as large. "There was so much smoke and debris," Sheridan says. Yosemite it a beautiful place. Too bad for that tourist.